Welcome back Jay-Squad to the "dollar shot". Let's find the next FujiFilm Instax square photo for my photo album. Today, we are visiting a state park full of manatees. School's from all around are here today... Let's go see why. Start the music! Alright, here are the four photos to vote on. Photo #1. I like the spread of this and the one yellow kayak that sticks out from the rest. Photo #2. A classic boardwalk photo with a tree that'll hit you in the head. Photo #3. 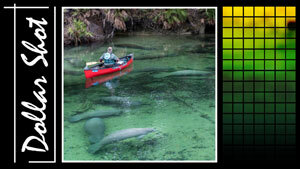 This photo sums up the day nicely with the manatees and a little red canoe. Photo #4. I like the black lines against the yellow in this photo. But for some people, it could drive them bananas. So, which photo do you like most? Vote in the poll or leave a comment below. And here we go. Our FujiFilm Instax printer is giving us this... I like it! Was that the photo you chose? Hope you enjoyed and see you back here for the next one. Thanks for watching!